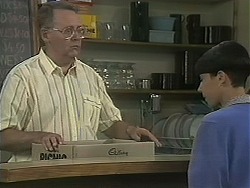 - Paul is confused by some of the things "Linda" tells him when he bumps into her at the Waterhole. - Paul and Melanie are concerned that Linda is back late from lunch. - It turns out that "Linda" is two people - twins. Caroline berates Christina and presses her for information on what she told Paul. They resolve to work out a schedule for going out in turn so no-one realises that there's two of them. 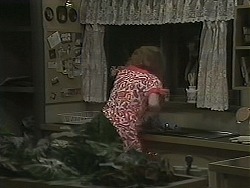 Hilary sees Caroline coming out of the house but Madge interrupts her spying! Hilary tells Madge that she has reason to believe that No.24 has been turned into a brothel. Madge thinks Hilary is letting her suspicious mind get the better of her! Paul is briefing Gloria on her new responsibilities now that Madge has resigned. Gloria is not impressed that Paul won't make her Assistant Manager but agrees to do her bit. Toby is telling Lochy stories about a snake in his sleeping bag. Lochy shows Toby a secret something in a box and says they're going to have a lot of fun with it! Caroline apologises for the way she behaved at lunchtime - she says she's just feeling a bit unsettled with the move and a new job. Paul is sympathetic and offers her a lift back to Ramsay Street later. They get talking about Hilary and Paul tells Caroline about Hilary's suspicions. Caroline laughs and says she'll have to quash the rumour. The new manager (Mr Griffin) tells Gloria that he won't have any more tabs in the bar and tells Gloria to hurry up and clean the tables too! Kerry, Joe, Harold and Madge have finished their dinner. Madge gives Harold the round-the-world tickets - and they leave on Thursday! Harold is pleased, but worried about how they'll organise everything. Kerry offers to fill in in the Coffee Shop though and so it's all sorted. Gloria tells Paul that she's thinking of chucking her job in - Damian is a terrible slave-driver. Also, he gets up everyone's nose with his efficiency. Paul tries to reason with her, but she says it's just not worth putting up with. She's resigning. 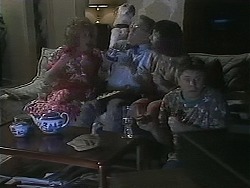 Madge, Harold, Kerry and Joe are watching the scary film. KERRY: Joe, for God's sake, it's just a movie! In the background, Toby and Lochy sneak around, whispering conspirationally. Harold is too scared to enter the house in the dark(!) Madge tells him off - the movie was a load of rubbish. She sends Harold off to bed while she fills the kettle for a nice cup of camomile tea. She hears a noise, and then a ghostly figure raises up at the kitchen window! Madge screams.